How can I ; Your and my world is being attacked and our own ideas are being used against us; Like you to See PEP BOYS Only has a Tire wheel cover and Hub Caps for FUTURA ; pep boys sued Ford Motor Over the Name FUTURA for a modal of a Car ;I Question why Ford Didn't even fight the Judges Judgment ? To put thru the uspto and to get approved ; This was all planed out we need to challenge these people and all involved and this Law Firm Of NY ; If I have to stand alone for the many I will ; Please write to me call me let me know your thoughts Write to our president Bush I have tried . I even tried to visit with him and Bill Clinton I have ideas that can help our world all people can you here my voice. Let the FUTURE people voices be heard worldwide, call these people email them share my story all I have is ideas powerful words I look at the past and see how leaders of our country and others stood up for what they believed in best. See my http://t.co/FtfYe3TeOz change.org webpage. To the owners of Pep Boys, you brought this global battle on to me and the people who would benefit using the brand FUTURE to realize their ideas. This is being destroyed because of Pep Boys oppositions over the years I had created the brand FUTURE concept applying for the rights since 2000. I have built global value to this brand. A representative of Pep Boys had indicated working with me a few years ago, and then a new agreement was drawn up that was contrary to the original stance. I was disappointed because I had relied on the word of the original intent. Money and power of your company is at issue here. The FUTURA tire of 1964 is separate from the brand FUTURE. If this company wanted the FUTURE brand, why hadn't they applied for it before? My intention is to have the brand FUTURE to have a global infrastructure that would help people. I would very much like to be part of this. A meeting with Mr. Jeffrey Rachor would be appreciated. Please recognize the global benefits of working with me. If these rights go abandoned, Chantecaille has the Fraud agreement of 2004 set up to get global rights of the people to take this agreement which was set up by my own lawyer in an agreement that was misleading to me. Your oppositions no. 91157538; 91157768; 91158277; 91158509; 91158520; 91158786; 91159159; 91164461; 91164602; 91165913; 91170501; 91173632 are destroying me and other people globally and their rights to use FUTURE for their own ideas. Discovery Period to close: 8/3/07; Plaintiff's 30 day testimony period to close 11/1/07; defendant's 30-day testimony period to close: 12/31/07 and Plaintiff's 15-day rebuttal testimony period 2/1408 is in progress. Please see our new colection of documents showing the fight to keep the trademark from being stolen by greedy businesses. NEW - read my letters to president Obama and the answer from the European Union. Oliver Chantecaille see it here! Pep Boys FUTURA Tires VS Brand FUTURE see documents here! Pep Boys FUTURA Tires For 4 Years VS Brand FUTURE and Kent G. Anderson, an individual, for automobiles, vehicles all goods and services associated and connected to. Kent Anderson says FUTURA is separate as Pep Boys only has a tire, wheel covers, hub caps For FUTURA; he views FUTURE as separate from FUTURA; and Kent envisions his years and ideas which he had applied to FUTURE In US; UK; Europe can benefit people globally for realizing their own ideas. The FUTURE belongs to the people; he wants to see that opportunity to be there for them. Kent sees the FUTURE Brand as a global open door infrastructure where all people and countries can bring forth new ideas, as well as, benefit by using their own ideas with the brand name FUTURE. A global revenue stream would help reinvest in people. ideas and rights in federal court VS Pep boys and the FUTURA tire of 1964; FUTURE is new. To: the People , the Visionaries ..
People have a right to know This is the peoples Future. doing business at 925 North Griffin, Bismarck, ND 58501 in a brand dispute. The details are at TTABVUE USPTO web page. can benefit by The Brand FUTURE For ther own ideas, and having a place to realize their ideas for products and services. they don't have the resources as other do. Their ideas are not heard. rights and ideas help create new economies globally. On May 22, 06 these rights to the brand FUTURE are threatened. I am looking for funds to equally represent these rights and funds for a start up company. I want people know who I am and what I believe in. 2010 My Name Is Kent G Anderson. Having big ideas, I had aplied for the Brand FUTURE in 2000.
would apply for one good in a class and say that they claim all of the goods in that class. being controlled by the affluent. Pep Boys have also opposed FUTURE Brands. They have tires under the FUTURA Brand. class 16 and entertainment services. I've made nothing from my ideas and patents. I need help with advice and funds ,partners to protect this huge portfolio and global rights. We believe in our visions and have built the brand FUTURE around this vision. With our pending global infrastructure in all sectors, with our pending rights in the USA, UK, CTM, and with the sharing of the brand FUTURE with licensing potential, new jobs and opportunities will allow new infrastructures interconnecting facilities worldwide. With Our brand FUTURE in automobiles etc. and the large pending global infrastructure, new industries will be developed where people will have the means to test and market their ideas in any marketing sector. By working together and combining our resources with Our brands FUTURE and the pending projects in sharing through licensing, benefits can be gained by all people. * As one of many, we are strong. Our goal is to secure rights globally to the brand FUTURE, to create global opportunities from the brand so that all people can benefit from the brand FUTURE with their ideas and dreams. Global organizations and companies affiliated with brand FUTURE will create global resources and infrastructures that will allow development of new ideas and a means for new industries to be developed. Global benefits will be created for all people. * My vision and belief is that the brand FUTURE has the ability to create opportunities for all people and build new jobs and industries globally. Opportunities will be available to all people, especially the people who have ideas for products and services but do not have the resources. The opportunity would include using their trademarks, copyrights and patents with the brand FUTURE which would help inventors, etc. to be heard and to realize their potential. For example, individual's designs for automobiles etc. would be used and associated with the brand FUTURE. The global infrastructure built with the brand FUTURE would be able to support their efforts with knowledge and resources. By working together with the brand FUTURE and sharing by licensing ideas and products to each other, each individual will benefit from the brand FUTURE. Companies and individual will be allowed separately to benefit from the FUTURE brand globally. * Global Trademark Matter: Challenger vs. Kent Anderson over the brand FUTURE. I do not want to see the brand FUTURE controlled by one when it should offer benefits to many. I'm looking for trademark -attorneys who want to help. And Seeking volunteer help . 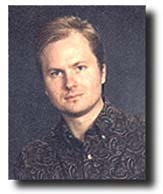 I am Kent Anderson, founder and president of FutureSM Enterprises. The brand FUTURE should be shared to allow people to benefit globally. I know that my plan and the years of my life's work will allow the creation of new jobs globally and create opportunity for others. I am asking for financial help. The brand FUTURE has challengers who have vast financial resources. As an individual, I do not have.the financial resources to meet the ongoing cost associated with the global pending infrastructure and for maintaining the intellectual property rights in the USA/UK/CTM. Please address questions and concerns to me. I am dedicated to our future. I see a more highly advanced world. I am very creative, hold many patents, enjoy inventing, and am a prolific thinker. Leadership value qualities, integrity and my love and fascination is with ideas in inventing, and thinking of a futuristic world. I find fascination with our past and the future, and how inventors, entrepreneurs changed the world. I care for our world and all people in all countries. I wonder about what future generations will say about us, and ask what they have done for us. What will our answer be? Goals is what we can do now for our world to benefit our world and to build new crossroads to our future to challenge the boundaries that hold us back, and to bring down the barriers that separate us as a people. To work in unity. There needs to be forth entity a place that people can market, test their ideas in any marketing sector focused towards our future. I am in the process of building this corporation, and have spent many years on it. Hopes are to find the leaders; people who have the same interest and goals I have. In the end, we will be able to offer what no other company in the world can. This will be accomplished by focusing on the new, not the old TMSM. This will be a large undertaking, and will provide a huge marketing arena, with many opportunities available. To test and to market, invest in properties to launch new industries, new products, and new services under the name FutureSM. Future related products in any marketing sector and focus on not the old, but the new corporation. 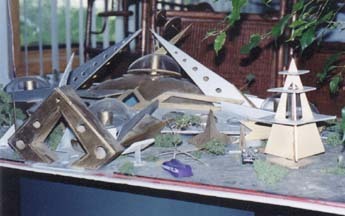 Could include on Future IslandSM, Research centers, retail, health, communications, etc. Qualifications for applicants would include integrity, knowledge, leadership abilities, positive attitude, and training in many different fields of today's industries, so that we may build the new industries for tomorrow. If you would like to be a part of a world leader into the FutureSM, and to work with some of the best minds and visionaries that will someday build new markets and invest in their abilities and dreams. This will represent a new way of thinking to be a future leader, and to uphold the best standards to represent the Future. It will reflect to the rest of the world a way to accomplish great benefits for our generation and future generations. You want to be remembered for what you have done and who you are. It is not how much money or power we have, but rather the ability to recognize someone's dream, and to help them accomplish it,SM and to test their ideas in any marketing sectorSM PAT. PEND. We have spent years of building the brand FUTURE(TM) with our pending rights in USA/UK. We want to create an open global infrastructures to allow all people and all countries the ability to share the brand FUTURE(TM) and to created and build new industries around it. We Would Like To Have And To Create An Open Door Policy to Allow New Products To Be Discovered To Benefit Our World . At This Time We Do not solicit New Ideas because We Don't Have The Resources To do So . We Hope Soon To Have Pending Partners And Others Who Want To Join Us So We Can build the projects and Open infrastructure. Looking for manufacturers, entrepreneurs. We believe our patents have global potential. 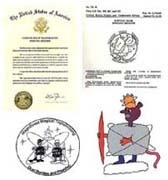 The patents can be viewed at www.uspto.gov. Search under patents and enter patent number. 1. Title: Method of Making a Pizza with the Crust Being in the center Patent Number 6077553. This is a pizza with the pizza toppings on both sides called the Pizza Flip TM. We have also reserved pizzaflip.com and have created a cartoon character called Pizza Flip for marketing. The market is for vending, frozen foods, restaurants and ovens. 2. Title: Simulated Time Ship Dining and Entertainment Arrangement Patent Number 6161341. Patent is a restaurant simulated time ship. Markets are amusement parks, hotels, shopping centers and restaurants. 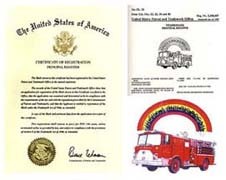 The patent has detailed drawings. 3. Title: Vacuum Cleaning System Patent Number 5870797. This is a unique self vacuuming and cleaning carpet system. Market includes homes, business, aircraft, boats, automobiles, office buildings and power plants. Virtual Tire Imaging. As the automobile's tires are moving, moving images and written material will be for viewing at night. The patent has detailed drawing. The market is for automobiles, car shows and special events. We are looking for TV shows, news shows or talk shows, that want to interview us, to promote our ideas and projects to others; so they may benefit from our ideas. To help others by creating new goods and services by sharing the Brand FUTURE by licensing the BRAND FUTURE and our Intellectual Property to others work together . This creates the infrastructure to allow people to test and to market their ideas in any market sectors. We plan to help the world and we are looking for people who feel the same as we do. If you are interested and feel you have what it takes, please email me and tell me about your background, and what status you hold in society. What makes you unique or special in this world? What is your track record? Are you interested in investing? I would love to hear from you. Below is my contact information. We are accepting goodwill financial contributions to help pay for ongoing patent & trademark fees, etc. Licensing opportunities are currently available under the name FutureSM. 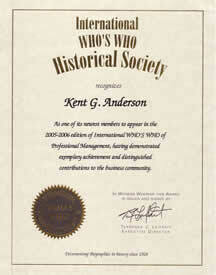 To identify and hold harmless Future Visionaries.com and Futurelicensingworld.com., Its owner, subsidiaries, etc. for any liability or claims related to any property loss or damage caused by your actions or any of the information. We do not accept under any confidentiality of any kind. If you use this site, you agree to these terms. We do not solicit ideas. We are marketing and licensing our own intellectual property right, our future SM brands, to entities, who, has what it takes to be associated with our future imageTM. Our products, good, and services represent our future familyTM and affiliated with the newTM. We do not accept under any confidentiality of any kind. If you use this site, you agree to these terms. WE ARE LOOKING FOR COMPANIES, INVENTORS, MARKETING COMPANIES, LICENSING COMPANIES ,ULTREPRENURES, MANUFACTURERS, ETC. WHO WANT TO USE OUR BRAND FUTURE WITH YOUR BRANDS AND FOR YOUR IDEAS, GOODS AND SERVICES . FOR THE FOLLOWING THIS CREATS THE GLOBAL OPORTUNITIES FOR ALL TO BENEFIT THIS IS NON-EXCLUSIVE SO WE ALL CAN BENEFIT . TRADEMARKS IN INTERNATIONAL CLASSES HAS BEEN ALLOWED AT THE USPTO UNDER THE BRAND FUTURE. ,FLAVORED WATERS ,AND MINERAL AND AERATED WATERS . TRANSMITTING INFORMATION VIA THE INTERNET. CLASS 3 CLASS THAT DEALS WITH COSMETICS, BEAUTY CARE . Restaurant Franchise offers many different food franchises all in one location. Choose from pizza franchises, donut franchises,coffee franchises,sub franchises, and more! Description: Browse the Small Business Opportunity site and learn about the top small business opportunities and franchise business opportunity listings available. We have comprehensive directories of business franchise for sale listings. Description: Food Franchise provides a comprehensive directory of fast food franchises including coffee franchises, pizza franchises, food franchises,ice cream franchises, donut franchises, and bakery franchises. ©2000-2017 TM, SM, Pat. Pending. All rights reserved and claims, rights set forth recognized by our laws and recognized by the courts governing them set forth.